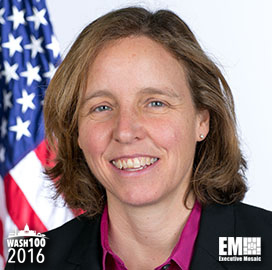 Executive Mosaic is honored to introduce Federal Chief Technology Officer Megan Smith as an inductee into the 2016 edition of the Wash100 — Executive Mosaic’s annual selection of influential leaders in the government contracting arena. Smith led business development activities at Google and served as vice president of the search giant’s Google X research lab before the White House appointed her in September 2014 to the federal CTO role. She has specified development of information technology policies and promotion of science, technology, engineering and math education as part of her agenda. During last year’s State of the Net Conference, Smith urged agencies to enlist professionals from the private sector and encourage agency employees to participate in digital projects. “We should have our amazing off-the-shelf products from tech, hosted products, and we should have things that we contract for, custom, but there should be someone in the room who speaks the language,” she said then. In October 2014, she unveiled the third edition of the Open Government National Action Plan that outlines federal efforts to deliver public services, promote fiscal transparency and increase access to government data. Her private sector career has also included time as CEO of public media company PlanetOut and work on various technology programs at General Magic and Apple Japan. Smith is also co-founder of the Malala Fund and has served on the boards of Massachusetts Institute of Technology and Vital Voices as well as on the U.S. Agency for International Development‘s advisory committee on voluntary foreign aid. Executive Mosaic congratulates Megan Smith and the White House team for their selection to receive this award.